"I'd always said to my friends and family growing up, when I started to run better in college, no matter what I'm going to do, I feel like God's blessed me with this gift, with running, and I'm going to work in a running store, I'm going to just scrap and borrow and beg for two years at least while I give this a shot, to run professionally." - Brandon Bethke talking about the difficulties of trying to run professionally after college and trying to make it financially. Bethke won the 5k at Payton Jordan in 13:25.82, good enough for the World Championships "B" standard (13:27), but has no shoe contract. Instead he has resorted to convincing a surfing company, Quiksilver, to sponsor him. Who was the greatest runner never to set a world record? IAAF Grand Prix Région Guadeloupe Recap: WR Holder Dayron Robles Wins 110 Hurdles In Season Debut With 13.35 US's two-time World Champs silver medallist Lashinda Demus set a world-leading time in the 400m hurdles with 54.92. *Jamaica's 400 Hurdler Danny McFarlane Is Almost 39-Yrs Old, But Still Going Strong And Looking To Break Record For The Most World Champs Appearances He's currently tied the record at 9 and shooting for a 10th. Even though he has won multiple Olympic medals he still isn't satisfied and aspires to a World Champs individual title. Yenew Alamirew's 7:27 3k Highlights 10 World Leaders To Start Diamond League Season In Qatar The meet saw Allyson Felix continue her winning ways in the 400m, Olympic 1,500m champ Asbel Kiprop get the win in the 800, Walter Dix burst back on the scene with an impressive 20.06 200m and American Jesse Williams win the high jump with a gutsy performance. The highlight for distance fans, however, was the men's 3,000m, where the young 20-year-old Ethiopian Yenew Alamirew (who burst on the scene last year out of nowhere, running 7:28 in Milan) opened up his 2011 outdoor campaign with a strong final 200m to pull away from former world champ Eliud Kipchoge to get the win in a fast 7:27.26 win and PR, as the first 6 men all set personal bests and 12 men ran under 7:35. SA Record Holder LJ van Zyl (48.11) Leads Countryman Cornel Fredericks (48.43) To A 1-2 Finish In 400 Hurdles Former World Champ Bershawn Jackson was 3rd in 48.44. Olympic Bronze Medallist Walter Dix Sets World Lead In 200m At 20.06 Dix after race: "Walter Dix is reloaded! ... I'm aiming high in Daegu and I can tell you that everyone is beatable." 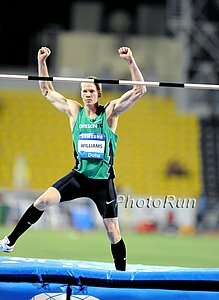 OTC's Jesse Williams' Gutsy Performance Wins High Jump After Cyprus' Ioannou cleared on his 3rd attempt, Williams cleared as well to get the win. 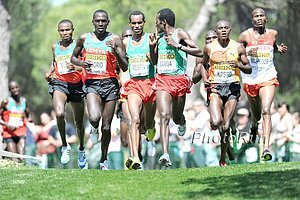 World's Two Fastest 10k Road Runners In History, Leonard Patrick Komon And Micah Kogo, Will Clash Next Weekend In Central Park At UAE Healthy Kidney Bobby Curtis will lead the American charge in a totally stacked race that also includes Moses Masai, Abdi, Tim Nelson, Ben St. Lawrence, Lelisa Desisa and Shawn Forrest. Learn How PowerBar's High Performance Beta-Alanine Supplement May Help You Run Faster Beta-alanine supplementation is scientifically proven to increase muscle carnosine levels. Carnosine helps with the buffering in lactic acid. Scientific studies indicated that beta-alanine supplementation may lead to increased athletic performance. 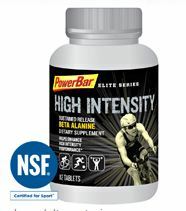 PowerBar's new High Intensity Beta-Alanine product takes the guess work out of beta-alanine supplementaion. Click here for more on this new product that may help you run faster. A Brief (But Great) Chat With Bobby Curtis The top American at Stanford in the 10k talks about going after the 27:00 barrier and training under Marcus O'Sullivan but borrowing stuff from Nic Bideau, Terrence Mahon and Zap Fitness. He did zero doubles in college but now does them 6 days a week. Sally Kipyego (& Many Kenyans) Are Experts At Recovery Wejo would agree, as he once lived with Patrick Kiptum and was amazed at how still he could be after a run. France's Steeple Record Holder Bob Tahri Says Fact He Had To Lead 10 Laps At Stanford Cost Him Chance At National Record In 10,000 Someone will have to check the tape to see if he actually led for 10 laps, but we agree that the rabbiting didn't last long enough and no one wanted to lead after Solinsky stopped setting the pace. 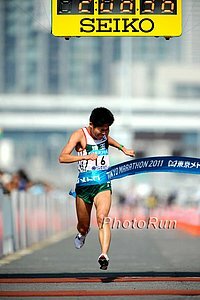 Proof That The Japanese Know How To Marathon Way Better Than The US: Stat Of The Day: 3 Japanese 2:09 Marathoners Ran 10ks Last Week & Two Set PRs And The Fastest Was A 28:24 At Stanford Additionally, the article talks about how their amateur 2:08 marathoner did a 3 x 5k race/workout last week all under 15:00 - 14:58, 14:48, 14:21. LRC The Good, The Bad, And Everything Else From the hot relay action at Penn to the excellent distance action at Stanford and even the sprints (and mile) at Drake, we've got it covered. Along the way we go ga-ga for Colorado coach Mark Wetmore and his new recruit Ammar Moussa as well as Jordan Hasay and Kenia Sinclair before we talk about how weak the men's DMR was at Penn this year. Plus, most importantly, our analysis of Desiree Davila's first pitch at the Tigers Game and how it compares to Carl Lewis. Well Said Asafa Powell Says For Track To Be Popular There Must Be Head-To-Head Meetings Of Top Stars We agree they can't clash only at global championships but at the same time the clashes should be rare or there will be little drama at Worlds. World Champs/Olympics - Geoffrey Mutai Will Not Run In Daegu! Kenya Unveils World Champs Marathon Team They name a list of 10 potentials, including Boston 1-2 Geoffrey Mutai and Moses Mosop, London winner Emmanuel Mutai, Rotterdam winner Vincent Kipruto, Paris champ Benjamin Kiptoo. And for the women, Boston champ Caroline Kilel, London winner Mary Keitany, Rotterdam winner Philes Ongori and Paris winner Priscah Jeptoo. Boston Champ Geoffrey Mutai Has Decided To Skip World Champs In Daegu And Run NY Or Chicago Instead He said, "I have ran in Daegu. Each time I was jinxed. I have therefore decided to give the event a miss." Big Prize Money On The Line For World Championships In Daegu Over $7 Million! 100 World Leader Steve Mullings Is Running The 200 This Weekend "I am not allowed to say what time we are aiming for. All I can say is, 'look out!'" Usain Bolt Helps Puma Boost Profits ... if that wasn't already obvious. *2:14 Marathoner Danny Kassap Dies At Age 28 Danny Kassap, a former world-class runner who fled to Canada from Congo, passed away a day after withdrawing from a local 10k race because he was not feeling well. 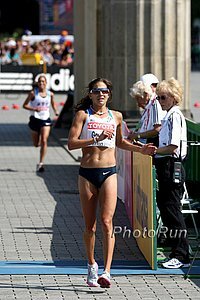 LRC Another Great Stanford Meet Is In The Books The 2011 Payton Jordan meet did not disappoint, as 22 runners got under the Olympic A standard in the men's and women's 10,000, as the "star" Americans in Matt Tegenkamp and Shalane Flanagan got beaten. In the men's 10k, the winner was 20-year-old Bedan Karoki, whose breathtaking move with more than seven laps to go instantly ended the race, which was the first one in American history where three Americans broke 27:30 (led by Bobby Curtis). In the men's 1,500, German Fernandez's struggles continued in the B heat (is it officially time to panic? ), while Lopez Lomong and Evan Jager returned to action in the A heat that was won by Ben Blankenship. In the ladies' 1,500, Jordan Hasay got a PR and collegiate leader but only finished 5th. The story of the steeple was that Mark Wetmore-coached athletes shined and got the Olympic A standards, as Emma Coburn impressed from the opening moment of the race while Billy Nelson waited until late to unleash an incredibly impressive kick. In the men's 5k, Elliott Heath's unreal kick wasn't quite enough to get him the win, as seven broke 13:30. Read all about as we recap the top action for you. *MB: Teg, Nelson 27:28, 13 under 'A' standard! *Bobby Curtis 27:24, you all saw that right? 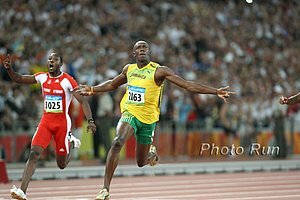 NY Times: Gatlin Looking To Outrun Competition And Suspicions USATF spokeswoman Jill Geer explains the Catch 22 of the doping world: "If he runs as fast as he did before, people will think he must be doping now. If he doesn't run as fast as he did in the past, people will say that was evidence that he really was doping and cheating." More On Andrews: "As soon as he gets the stick, it's over." LRC: Meb Attempting New York / Olympic Trials Double Meb Keflezighi joined the live NYRR 2011 ING New York City Marathon "Opening Day" show from Columbus Circle to announce he was running this year's marathon, 69 days before the US Olympic Trials in Houston (in 2004, Meb did the Olympic and New York double 70 days apart). Meb will take on defending champ Gebre Gebremariam, while defending women's champ Edna Kiplagat will face Jen Rhines. Athletes Apolo Anton Ohno and Curtis Granderson were on hand for the marathon kickoff along with celebrities Al Roker and Ed Norton. *USA Today Article Meb also reveals that he is recovered from knee injury he sustained right before NYC Half that occurred during an "altercation with a dog in Central Park." Craziness At The ACC Meet: Florida State NCAA Long Jump Champion Ngoni Makusha Runs Legal 9.97 In His First 100m In 4 Years, Florida State Storms Back For 7th Straight Title Makashua had never run a 100m in college until the ACC meet, and he ran 9.97 for the win. Simply amazing. Florida State pulled out all the stops to storm back from 40 points down to win the title. Makusha wasn't even the meet MVP, as Maurice Mitchell got it after his 20.17 in the 200m and runner-up in the 100m. *Thread here. However, distance fans will be most impressed by Irishman Ciaran O'Lionaird (see below). LRC John Kellogg Explains How He "Predicted" The Unpredictable - A Sub-2:03:59 In Boston LetsRun.com's coaching guru explains the rationale behind his non-prediction that is making waves around the globe. Years of timed out-and-back and straight-shot tempos with the wind in Waco, Texas (and other windy Texas venues) proved invaluable to his understanding the effects of the wind. 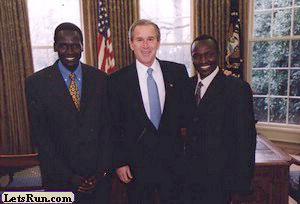 JK took a stab at converting the Boston performances by Mutai and Hall to London and Berlin and even reveals what would happen if the Boston Mutai raced the London Mutai. Grete Waitz Loses Battle With Cancer Waitz is best known for being a 9-time New York City Marathon champion, a class act, and a pioneer in the sport, but she also was a 4:00 1,500m runner and an 8:31 3,000m runner. As a kid, watching her on ABC win NYC every year was one of the site founders' earliest running memories. She will be missed. Thanks to Leo Kulinski for the photo. Another one here. 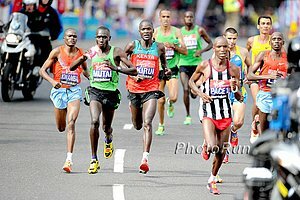 LRC Emmanuel Mutai Runs The Best 10km Ever In A Marathon To Destroy The Field & Arrive As One Of The World's Best A lead pack that was a who's who of marathoning went through 30km together, but soon the race would be nothing but a coronation for Emmanuel Mutai, who destroyed the field with a 28:44 4th 10k and ended up with a 2:04:40 course record. Almost as big of a story as Mutai's incredible run was the fact that the 2nd placer ended up being one of the all-time greats - Martin Lel - who shocked even himself in his first marathon since Beijing 2008. American Jason Lehmkuhle was the only elite American finisher as the three rookie American marathoners went out too fast and blew up - none worse than Mo Trafeh, who ran with the lead pack for 15 km. 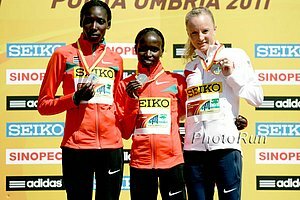 LRC Women's Marathoning Has A New Star Named Mary Keitany Keitany knocked nearly 10 minutes off her personal best and knocked Liliya Shobukhova off her pedestal as the best in the world, as Keitany ran the first sub-2:20 since 2008 and made mincemeat of "undoubtedly" of the strongest women's field in London history. 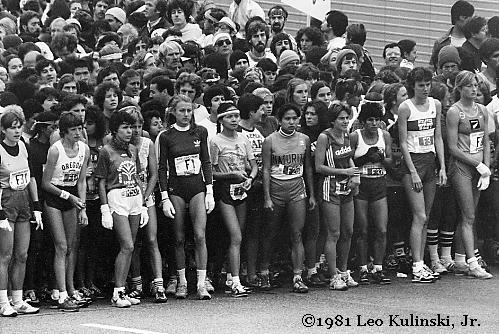 All together, a record 22 women broke 2:30 - but that didn't include US Olympian Magdalena Lewy-Boulet. World Leads By Mathew Kisorio & Filomena Chepchirchir At BIG 25 Berlin Kisorio's time of 1:12:13 is the 3rd-best 25k all-time and misses Samuel Kosgei's World Best time by only 23 seconds. Nelson Mandela Bay Spar Women's 10k Challenge: Barefoot Runner Lebo Phalula Wins Disputed Race After A Competitor Accused Her Of Cutting A Corner She won with 33:34 to Irvette van Blerk's 33:38. Apparently video showed she did cut the corner, but since it wasn't marked off that she couldn't run there, officials could not penalize her. Phalula is the same runner who tried to grab microphone at SA Champs to rant about the unfairness of Caster Semenya competing. UK's 37-Year-Old Euros 3k Champ Helen Clitheroe Returned To Race With A Win At The Luzern Stadtlauf 4.25K City Run She won by 26 seconds in 12:56.1, just missing course record by 5.6 seconds. *Profile On Nick Arciniaga, Who Will Run The Marathon At World Champs This Summer Arciniaga's father: "Virtually every evening before Nick races, the anticipation of the potential outcome is as nerve wracking and exciting as the feelings I felt as child waiting for Santa. 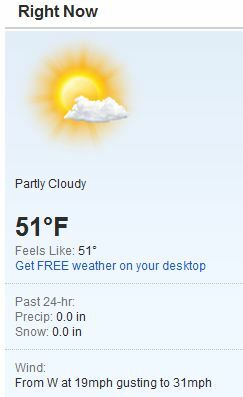 It is that awesome. I get so high in the excitement waiting for the race to start that I cannot sleep; whether I follow the race in person, or on the internet." 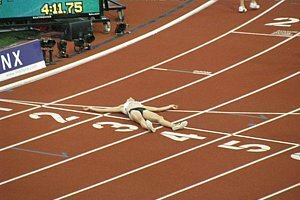 *Hepstrack.com is the best place to go for meet coverage and results. *Princeton Men Win Ivy League Title In what was an extremely close meet, Princeton ended Cornell's 8-year winning streak winning by 11 pts, 197 to 186. *Princeton Women Secure 2011 Crown Point totals were close among the top teams, with Princeton winning with 132 points to Cornell's 113 and Brown's 101. *Connecticut Men, Louisville Women Capture Big East Champs Titles Villanova's Sheila Reid battled Georgtown's Emily Infeld in both the 1,500 and 5k, with Reid coming out on top in both. She won the 1,500 in 4:23.98 to Infeld's 4:25.00 and the 5k in 16:13.29 to Infeld's 16:14.06. *Louisville Men And Women Both On Top After 2nd Day Of Big East Champs On 2nd of three days, Syracuse's Tito Medrano won the 10k in 29:34. Lousiville's Matt Hughes won the steeplechase in 8:44. Qatar Confident About Winning 2017 World Champs Bid Qatar Athletics Federation Pres. : "[The government] want to make a healthy and educated generation. It's better than building an army. An army is not a good investment in the people. People are more valuable than buying weapons and putting them into storage." Oregon Twilight OTC Defeats U Of Oregon DMR The highlight of the meet was the frat 4 x 100, men's DMR. We're big fans of AJ Acosta, but he was no match for Andrew Wheating on the anchor. This was Wheating's first race since last summer (he had a calf injury this winter). *The Oregonian Recaps Some Events From Oregon Twilight Meet Oregon women ran into some trouble in their 4 x 1 as they came almost to a complete stop during an exchange. 3rd leg English Gardner said, "It's a little nerve-wracking when you have to run away from Amber Purvis (school 200 record-holder) ... I did leave a little bit early, I guess. I got nervous. ... She yelled at me, 'Stop!' I was like, 'OK. Sorry.'" First Gaza Marathon Held The race had a bunch of kids running relays, but only 9 people in the full marathon. How about this quote, "The people find it strange - if they see someone running, they think they are crazy. Usually Palestinians only run when there are air strikes or when they are frightened." Azmeraw Bekele Wins 10,000 At Ethiopian Champs The 59:39 half marathon runner who also was Ethiopian XC champ in 2010 got another national title after not running for a week due to an injury. Geoffrey Mutai's Training Partner Was Killed In A Car Accident In Kenya The accident was a few weeks ago. The article also says Mutai might mull a World Championships run. Is that really true or is he just trying to play nice with AK? Recommended Read: The Independent Catches Up With The Great Paula Radcliffe - Even Olympic Gold In 2012 Won't End Her Career Radcliffe talks about how childbirth has changed her and her fitness. "I can definitely run a sub-2:20. Whether I can run sub-2:15 I don't know." Recommended Read USC Hurdler & National Leader Nia Ali Is On Comeback Trail After Shutting Down After Her Father's Murder-Suicide Rocked Her World (And All Of Philadelphia) Ali's father had been trying to contact her for months but she didn't respond and then there was huge guilt after he did a murder-suicide. Spurned Ex-Track Coach Is One Who Initiated Boise State NCAA Investigation A former track assistant snitched on a bunch of tiny infractions and now, sadly, while players at Auburn get paid cash and nothing happens, the Boise State football team will be punished in a big way for letting its football players sleep on couches before the dorms open, as they've been cited with a lack of "institutional control." Drake Steeple Winner Shayla Houlihan Says She'll Never Go Back, As She Wasn't Allowed To Do Victory Lap Since She's A Pro/Not A Collegian Drake needs to either let non-collegians into a race as full-fledged members or not let them race at all. The Oregonian: Vin Lananna Opens Up About The 2012 U.S. Olympic Trials Also interesting to note that Matt Centrowitz junior and senior are 3-4 on UO's all-time 1,500 list, with father currently .22 faster than son. Top Runners Thrive At Team USA Arizona Assistant Coach Trina Painter: "I remind our women that what they have now is a unique and special opportunity [that's] not to be wasted. My generation had to make its own way, but they're part of a movement to bring this sport to another level." Dathan Ritzenhein Talks About His Comeback From Surgery He's running 70 miles a week on the Alter-G treadmill and hasn't given up hope of running the US track champs. And we liked this exchange with his wife after Boston. Wife: "It's okay if you're in a bad mood today." Dathan: "Why would I be in a bad mood because everybody ran well?" Wife: "Because you weren't there to be able to do it." LRC 2011 Drake Relays Recap: Boaz Lalang Wins 2011 Drake Relays Mile Over Alan Webb, Who Is Fourth Webb, the American record holder, got the short end of the stick in the final sprint between Kenyan Olympian Lalang, NCAA breakout star Chris O'Hare and World Champs semi-finalist Peter Van Der Westhuizen. In other action, Jenny Barringer went wire-to-wire in the 1,500, Jeremy Wariner won the 400m and Adam Nelson went over 70 feet for the first time in 3 years to show he could be a factor in 2011. Women: Misiker Mekonnin Upsets Fellow Ethiopian Wude Ayalew Over 56,000 runners ran this year, making Bloomsday a tremendous success. We should do a series on America's great road races. 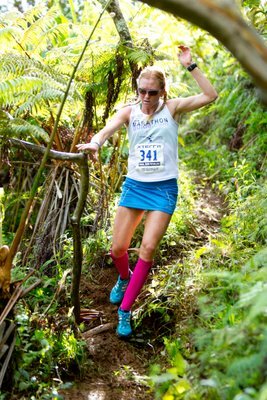 Josh Moen and new American citizen Janet Cherobon-Bawcom (who beat 2:27 marathoner Amy Hastings) were the first Americans, picking up an extra $5,000. LRC: Wejo Speaks: Desiree Davila Inspires Us All At The 2011 Boston Marathon She had the entire press room and Alberto Salazar yelling for her. LRC: Men's Post-Race Reaction The top 4 were all pleased with their blazing fast times. Ryan Hall summed up the magical day: "I am running 2:04 pace and I can't even see the leaders." Steve Nearman, the former Washington Times reporter who first broke the story about Webb's pro contract in 2002, reported Wednesday night that sources (plural) close to Webb confirmed that Alan was going to be coached by UVA's Jason Vigilante and we said, "Nearman can be trusted." Well, Nearman is trusted in the industry, but Alan's wife Julia Webb has written and said, "Just wanted to give you a heads up that the story is definitely not true ... we are still looking at the options. No decisions made although Vig (is) still a good option." We contacted Nearman and relayed him Julia's comments and he said, "I stand by my story and I stand by my sources." *RRW: Alan Webb's Agent Ray Flynn Calls Webb Story "Totally Bogus" In reality, Flynn said the story is "at this stage totally bogus." 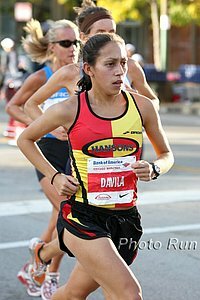 LRC: Desiree Davila Looking For Respect In Boston Davila finished one spot behind Kara Goucher at the last World Championships in the marathon, and she's hoping to finally get out of Kara's shadow at Monday's Boston Marathon. LetsRun.com has spent the last six years getting a mole into the Hansons-Brooks team, and now thanks to him we have this inside look at Desiree's preparations for Boston, which has included a 123-mile week. Article and video interview plus some video of the Hansons-Brooks training runs. Caster Semenya Does 800m/1,500m Double At S. African Champs (2:02 And 4:12) Her first minor test at 1,500m was successful. S. African Hammer Throw Champ Chris Harmse Wins His 16th-Straight National Title The Commonwealths champ can never compete in the Olympics because the hammer is always on Sunday, and for religious reasons, he can't compete on Sunday (Eric Liddell would approve). Gerry Lindgren's Legendary 47-Year-Old High School National Record Survives Scare From Lukas Verzbicas And Edward Cheserek Verzbicas hammered home over the final lap to pull away from Cheserek, but in the end, Lindgren's 8:40.0 lived to see another day, as Verzbicas ran 8:40.70 and Cheserek shattered the indoor and overall sophomore class records with his 8:42.66. More: Gerry Lindgren 8:40 Indoors *LRC MB Lukas V. 8:40.7!! *LRC MB So close *Running Times Q&A With Lindgren About His 8:40.0 Note: This article incorrectly implies the record was set in a 16-lap race. *Bernard Lagat Says He Wants To Run 12:49 "In my head, I have just put all eggs into that one basket. Monaco. 5,000 meters. If I don't get it there, I don't know when I will get it. It's good to aim high because to me 12:49 is the highest I can put it now." *IAAF Daegu World Challenge Preview: Recent Drake Relays Mile Champ Boaz Lalang Vs. World 1,500m Champ Yusuf Saad Kamel In The 800 David Oliver in 110 hurdles and Carmelita Jeter in 100m also headline field. LRC Week That Was: Praise For Kara And Desiree, Dirt Tracks In America, German Fernandez And Mental Barriers As you recover from Boston and London and get ready for Penn, Drake, and Stanford, we have some praise for Kara Goucher and Desiree Davila's sportsmanship, look at some young American milers struggling, and much more. Andrew Bumbalough Thriving In 1st Year As Pro One Year After Getting Mono And Nearly Being Left Out Of Nike's Plans This is an unbelievably good piece of writing for a college newspaper. It also reveals he's gotten his mileage up to 90 per week from 65 to 70 in college.